In cooperation with D66 International a public discussion ‘The Affiliation of Society to the Family and Youth’ organized by the Boris Divkovic Foundation was held at the Historical Museum on July 16, 2018. The discussion moderator was Valida Repovac Nikšić, and the lead speakers were Mirza Emirhafizović, Žarko Papić, Nermina Vehabović-Rudež and Neira Dizdarević. Mirza Emirhafizović, demographer and assistant professor at the Sociology Department of the Faculty of Political Science, explained the current demographic situation and low birthrate in Bosnia and Herzegovina, and he further concluded that at this moment Bosnia and Herzegovina is severely facing birth dearth and that country’s low birthrate is continuing to decrease. ‘Bosnia and Herzegovina is currently among the bottom ten countries with the lowest birthrates in the world. The current situation in the country is causing such trends, as well as the lack of the social politics that would stimulate birth and formation of the families. Moreover, even though youth in Bosnia and Herzegovina leave their parents’ houses quite late, they decide to migrate increasingly often. This indicates the country’s approach towards this population category,’ explained Dr. Mirza Emirhafizović. The analyst Žarko Papić spoke about the socio-economic conditions for family creation and the thoughtlessness of the ruling political elite on the demographic disaster that has befallen Bosnia and Herzegovina. ‘Despite the fact that Bosnia and Herzegovina has received the greatest financial aid from the international donors after the 1990s war, it has resulted in completely insensitive social politics and increased poverty rate. As B&H had many young war victims, it cannot afford the current migration of human capital. It is important to emphasize that not only students and poor are leaving the country. The youth over the age of 35 quit good jobs and take with them their entire d Papić. Neira Dizdarevic, the most active member of the Canton Sarajevo Council, explained how the implementation of the social protection measures are applied and the relation of the current running structures towards the social politics. ‘I have seen many situations that have indicated negligence towards the application of social politics in Canton Sarajevo in my four-year mandate. Nevertheless, I would like to point out that it took me two years to persuade the Council to extract couple of thousands of KM from the budget of Canton Sarajevo, which amounts to about 800 million KM, for the purchase of hospital beds for the mothers who stay with their ill children at the Pediatric Clinics of Clinical Center,’ said Dizdarević. Nermina Vehabović-Rudež, psychologist and psychoterapist, spoke about the importance of family for the overall mental health. ‘It is essential to have social structure that ensures minimal social security, family, good jobs and qualitative education to maintain mental health. We should all wonder how much of that is currently present in our society,’ discussed Nermina Vehabovič-Rudež. The fact that we have publicly discussed these topics is already a sign of improvement, nevertheless, Boris Divkovic Foundation will raise again this problem at the coming public debates and other activities, and will continue to support the idea of taking the responsibility and solution search. 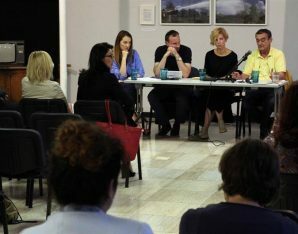 Boris Divkovic Foundation organized a public debate named ‘Culture and Politics’ in Mostar last night, where the participants discussed whether Mostar can be the European Capital of Culture in 2024. The organizational team Strategic Cultural Development of the City of Mostar was present at the event, the moderator of the debate was Dr. Vjekoslav Domljan, the coordinator of the Strategy and the member of the Board of the Directors of the Boris Divkovic Foundation. 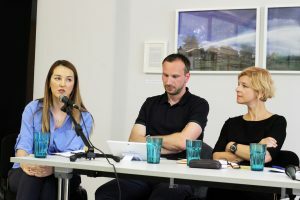 The participants of the debate were the representatives of the academic community of Bosnia and Herzegovina and political parties, including Dr. Sarina Bakic, Dr. Dario Terzic, Dr. Tanja Miletic Orucevic, Irma Baralija Mr. and Milija Bjelavica. During his presentation, Dr. Domljan explained the correlation between the culture and politics from the economic perspective, and clarified that the cultural development is one of the elementary driving forces of the society, alongside with the technology and improving governing structures. Dr. Sarina Bakic, Professor of Culture and Diplomacy of the Department of Political Sciences, University of Sarajevo, discussed the concept of culture in the contemporary society, and critically analyzed the youth perception on culture, as well as the necessity to urgently modify its fundamental values. Dr. Dario Terzic, the journalist from Mostar who is the doctor of communication and a member of the organizational team Mostar 2024, spoke about the actual goal of the project Mostar 2024 and its basic values of unity of the city on Neretva River and awakening the elementary civil principles. ‘It is also banal just as the Winter City has proved that it is possible. The fact that Mostar has passed to the next level is a good indicator, whereas Tirana, for example, is eliminated. Here, the culture is the driving force that should awake the citizens of Mostar, and not the politicians’. The dynamic dialogue was held between Tanja Miletic Orucevic, the representative of the cultural-artistic sector, and Irma Baralija, the representative of the Mostar City Board of Nasa Stranka. 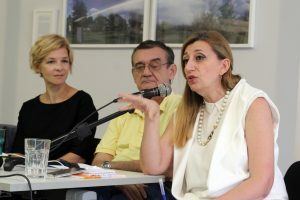 Tanja Miletic Orucevic introduced the potential positive effects of this project on Mostar City, while Irma Baralija expressed her doubts due to the methods that the current governing city structures are practicing, where the local elections have not been held in over 10 years, and who have already taken all the praise for this project. The analyst Žarko Papić spoke about the socio-economic conditions for family creation and the thoughtlessness of the ruling political elite on the demographic disaster that has befallen Bosnia and Herzegovina. ‘Despite the fact that Bosnia and Herzegovina has received the greatest financial aid from the international donors after the 1990s war, it has resulted in completely insensitive social politics and increased poverty rate. As B&H had many young war victims, it cannot afford the current migration of human capital. It is important to emphasize that not only students and poor are leaving the country. The youth over the age of 35 quit good jobs and take with them their entire families,’ concluded Papić.